Jumpstart Capital is the capital arm of Briovation; a unique and creative platform focused on identifying, funding and supporting high growth, “big idea” innovative healthcare companies across the United States. 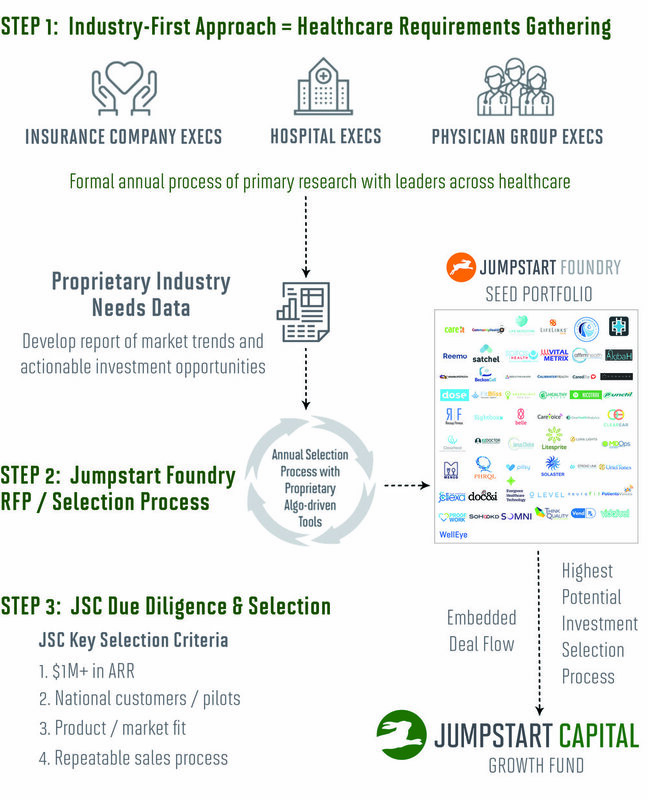 Combined with our other portfolio companies: Jumpstart Foundry and Health:Further; we offer a powerful platform for venture investors looking for an unfair advantage in healthcare venture capital. The U.S. healthcare industry is a study in contrasts. On one hand, ours is the single most high cost system in the world, pulling nearly twenty percent of our $20TN gross domestic product, and delivering poor results relative to traditional measures of health status. On the other hand, our healthcare system is the research and development arm for the world, serving to deliver consistently remarkable solutions to long-standing health problems. Whatever the case, the fact is that the titanic U.S. economy is headed for a demographic and macroeconomic iceberg, with nearly 80M baby boomers transitioning from an average age of 70 to 80 in the next decade, and associated healthcare costs through the Medicare and Medicaid programs reaching unsustainable levels. At Jumpstart we believe that this nearly $4TN industry, which is inefficient in many ways, focused on healthcare rather than health, and likely unfixable through legislative action; is ripe for marketplace disruption through some of the same market and technology driven forces that have disrupted and disintermediated so many other industries in the last twenty years. Our strong view is that innovative ideas, creative entrepreneurs, and hard-working, scrappy small companies are going to play a major role in this disruption, and we’re proud to offer a platform for investing in this thesis that we believe offers an unfair advantage to our investing partners.